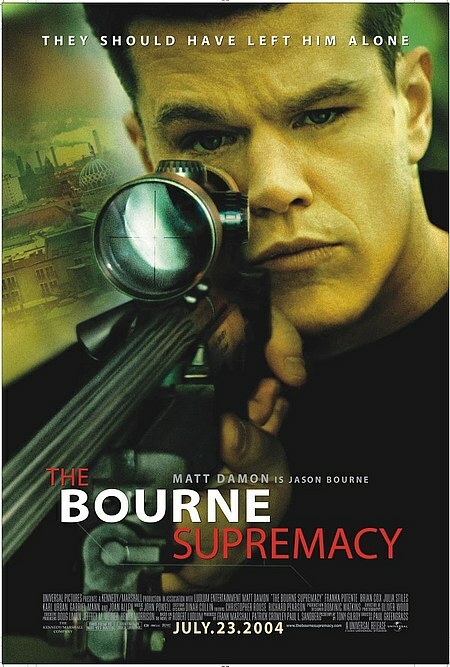 The Bourne Supremacy (2004) | Tales From The Ipe! Much like The Bourne Identity, I’m pretty sure I saw this movie, but I don’t remember it, and I don’t have any record of it online. So, I think it’s new to me. On my day off, I rented The Bourne Supremacy through Netflix, and watched it from the comfort of my home, no one home, and the volume set to LOUD. I’m enjoying the Bourne movies, as I’m finding the plotlines enjoyable, unpredictable, and the protagonist identifiable. When you can watch a movie and enjoy it, without it feeling formulaic or derivative, and you are rooting for the main character, that’s a good movie. I’m looking forward to watching the final movie in the trilogy next week, The Bourne Ultimatum. I love the series…Jimboy is buying me the series for Xmas…at least I hope he is. I have to buy that too? Dang. You are an expensive brother to keep happy. Oh by the way, I might have a surprise for you. I’m working on it.